Blackmore's Night has talented players working to create the sound, but the well of ideas is starting to run dry. 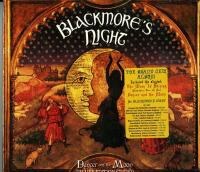 Blackmore's Night is a band whose architect has described it as sounding like "Mike Oldfield meets Enya." For most of their past catalog, this is an apt description and a fine enough compliment to pay. Even so, troublesome times are abound on their latest disc Dancer and the Moon. On most of their back catalog (including the well-rounded and pleasant Village Lanterne) they balanced Blackmore's Renaissance flair with his classic rock chops he had honed previously in Deep Purple and Rainbow. There was an even mix of everything -- the upbeat, the slow-burning ballads ("Windmills" amongst the best of these) but the latest finds them stuck in a rut. Opening with "I Think It's Going to Rain Today", something seems amiss right away. It's a pleasant treat of a track to be sure, but it sounds like Blackmore's Night by way of the Cranberries, with a bit of the Corrs' signature sounds sprinkled on top. While they may have borrowed heavily from Renaissance sounds and song structures in the past, they still managed to create a sound that sounded unique and that truly belonged to them. "Troika" manages to bring a little of that back, and for a band previously so focused heavily on medieval European tropes, a little bit of Russian flare is a welcome diversion from the standard subject matter. Elsewhere plaintive ruminations like "Minstrels in the Hall" sound too much like "Windmills, Part 2". This is a problem that is evident all over the record. It isn't so much that the music is bad -- far from it. All is well performed, mixed and polished, but perhaps too polished at times. Referring back again to Village Lanterne, Blackmore's Night has in the past managed to strike a balance between the joyous and upbeat and the more mellow. They do break out and show a little of the old free-wheeling joy on the album's title track, and on "The Moon Is Shining (Somewhere Over the Sea)" -- but yet again they recall past strong tunes a bit too much (Think a part 2 for "Just Call My Name (I'll Be There)"). Again, the playing is smooth and crisp, but a bit too polished to really stand out. In spite of these shortcomings, some of the gems really do make this album just a bit better for being there. "Temple Of the King" feels like what would happen if Loreena McKennitt joined them and started to rock out -- and in a completely flattering, not overly-cribbing kind of way. Blackmore's Night has hit a wall with this release. On previous releases the production was most definitely polished, but they had more of an adventurous spirit working for them. Here everything sounds like they are playing it safe, and not taking chances as they once did. This results in an album that is certainly pleasant to listen to, but is ultimately a disappointment when held up against the far better things this band has been able to do in the past.